Loading the car for that trip is always an adventure. 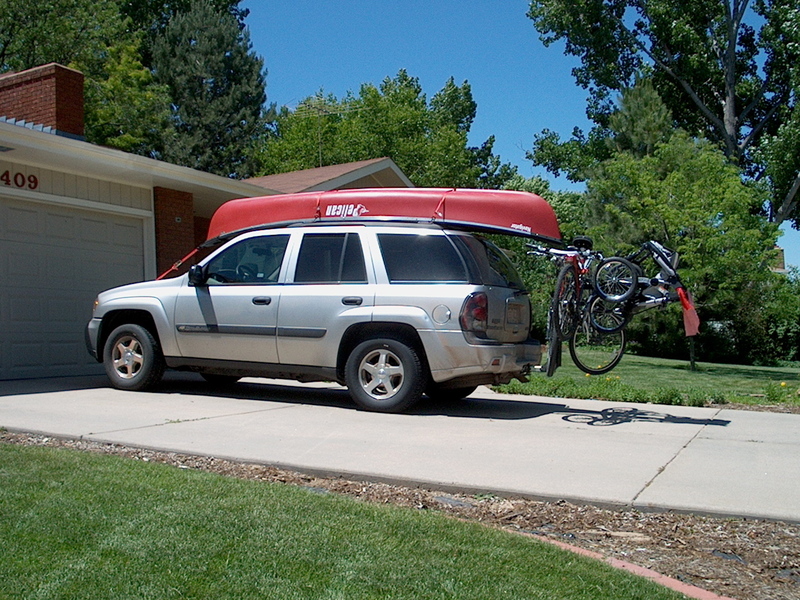 Food, clothing and games for a week are standard, and the suitcases and Rubbermaid bins fill the back of the Trailblazer quickly. We like to have a couple of portable camp chairs for lazy afternoons on the patio with a book and a little chocolate, so those purple and green cases take their places among the luggage. We situate the bag of shoes beside the hanging clothes and then fill some random spots with a kick ball and Frisbee. And of course, we can’t go anywhere without a couple of laptops! Pillows, jackets, and an assortment of last minute “I almost forgot about . . . ” fill the remaining empty spaces – and we’re almost ready to go. 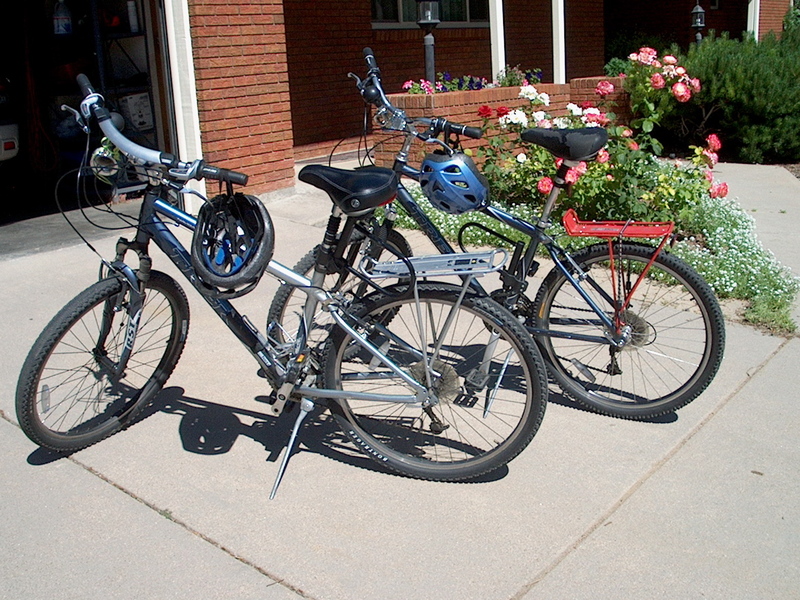 In addition to the necessities, we always take our recreational transportation. 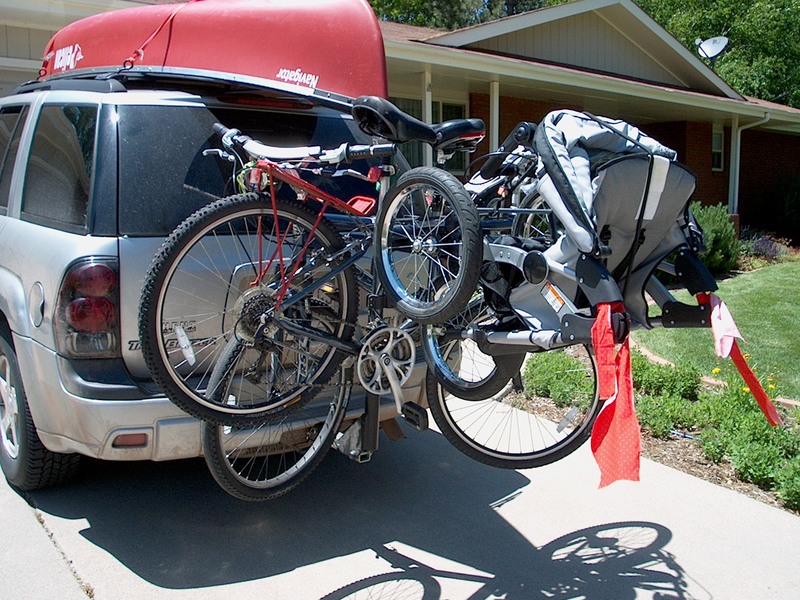 Our bikes ride securely on a rack on the back of the car. The Vail/Avon area has some great bike trails for riding – with or without the grandkids – and we look forward to a daily ride. We love peddling along the Eagle River while dreaming about which house will be ours. I’ve imagined us living in everything from a tiny condo to a grand mountain home on the side of Beaver Creek Mountain. That dreaming is one of my favorite pastimes! 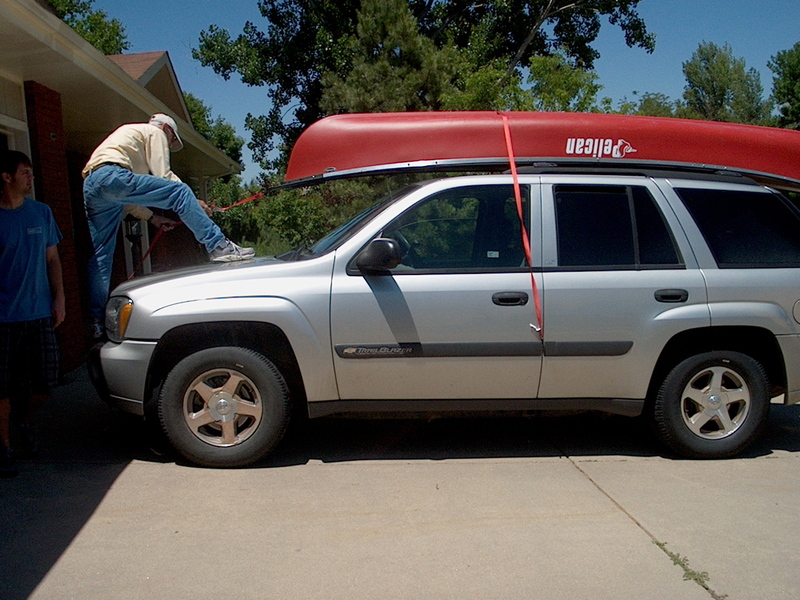 The canoe has also become a must have, so Don secures it to the top of the car. He’s getting really good at that as evidenced by this year’s trip which was free of vibrating tie downs or a slipping canoe! We all love to spend a relaxing afternoon on Nottingham Lake, and even the young grandkids are learning how to paddle – sort of. Due to some extenuating circumstances, this year we included a couple of new modes of transportation. 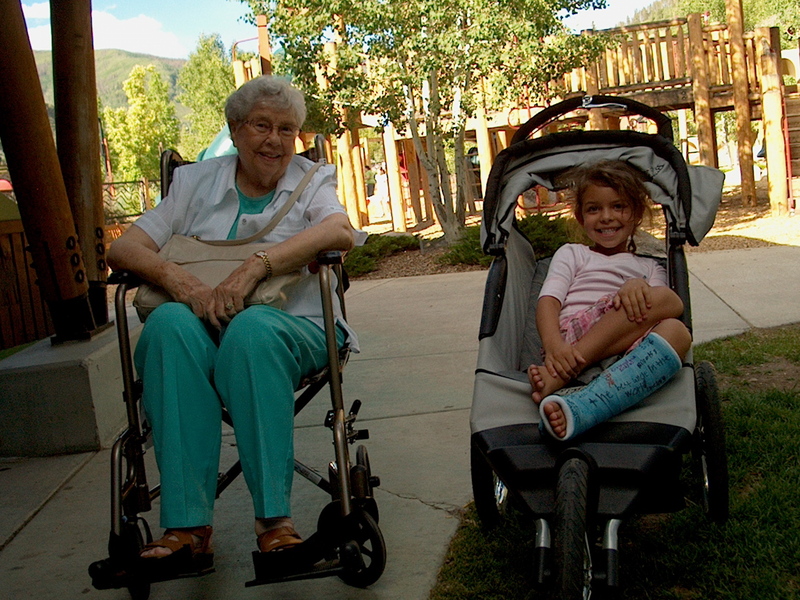 Degenerative arthritis in her back is making it very difficult for Grandma Leona to walk long distances, so we added a cute little transport chair to our assortment of rides. 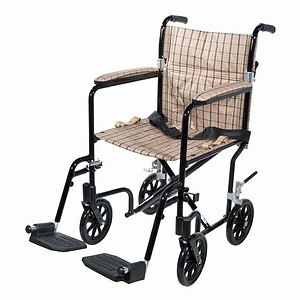 Lightweight and easy to lift, it was small enough to fit in the back of the car (very fortunately) and provided easy access to the park and other attractions within walking distance. Just a few days before departure, Katie’s jump from the top stair resulted in a broken leg and the doctor’s instructions to put no weight on that leg for 10 days. Briefly we thought the Sandbergs would have to cancel, or at least be very restricted in activities, because carrying Katie any farther than the couch or the bathroom is taxing. 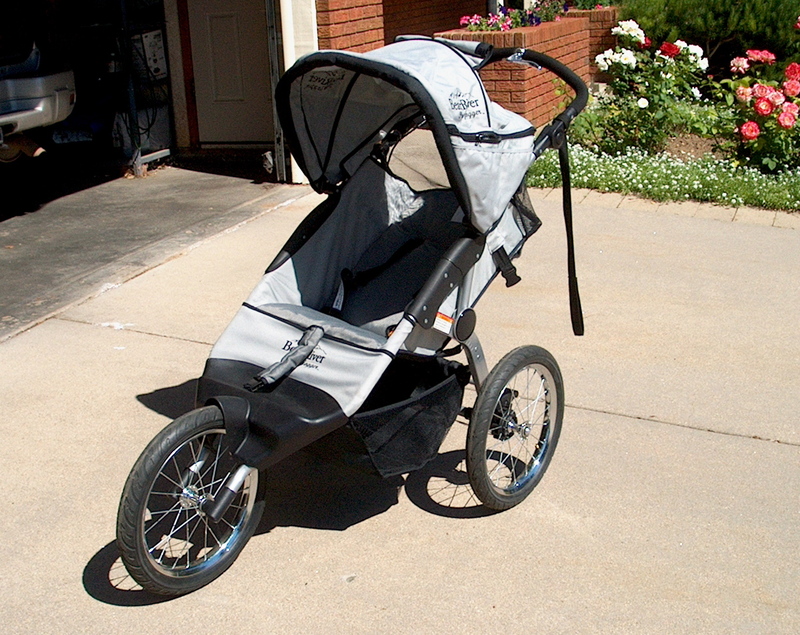 But when I remembered the jogging stroller I picked up at the thrift store several months ago (I couldn’t pass up that $30 deal! 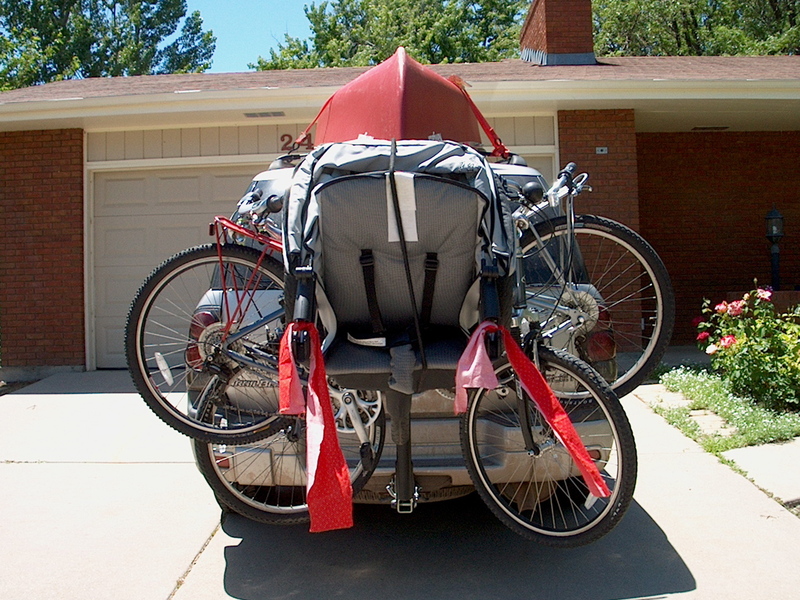 ), we were set – once Don got it strapped to the back of the bike rack. Katie is still small enough to fit in the stroller, even if not real comfortably, and we were able to wheel her out and about with relative ease. And Sam enjoyed it on some early morning jogs with his Daddy and Auntie Em. By the time we get everything in and on, we’re beginning to look like the traveling salvation show, and I’m wondering if it will all stay in place at 70 miles an hour. We don’t look too bad from a distance . . .
but this is the view if you get behind us! Yes, those flags are made of Christmas fabric. What a great look! I wish I could have been in the travelling show–it looks like a really fun place to be.